view, edit, delete, and/or set permissions on a particular folder and each task within that folder while the same department head is not allowed to view tasks in a different folder (i.e. different project), you can use the following solution to set permissions for each department head. 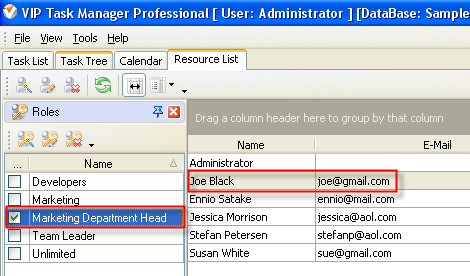 To assign this resource to a role highlight Resource ‘Joe Black’ in Resource List and check box “Marketing Department Head” in Roles Panel. Open Task Tree and highlight the task group that can be viewed by the department head and where he can assign tasks to his subordinates. To grant the permission to view the tasks of the subordinates and be able to set permissions for that task group select “Allow” for role 'Marketing Department Head' in Permission Panel. The department head Joe Black will automatically inherit the right of the role 'Marketing Department Head' to view, create, edit, delete tasks for “Project 1” task group.